Relax safe in the knowledge you’re always protected: 24-hour alarm monitoring, swift expert response and instant keyholder despatch to your property are just some of the features of our industry-leading alarm monitoring service. At Banham we realise how important vigilant alarm monitoring is to your personal safety and the security of your property. We have been protecting people and properties since 1926 and monitoring alarms with our own in-house Alarm Monitoring Centre since the early 1980s. 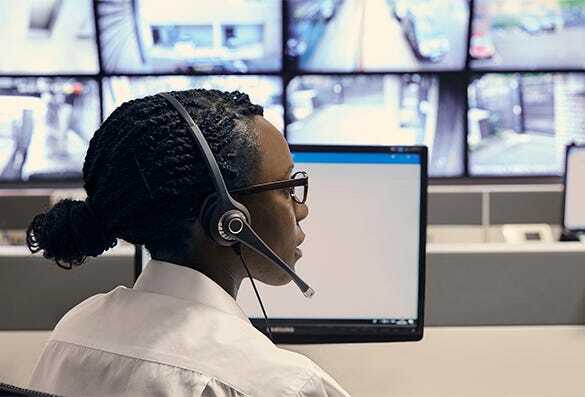 Now London’s leading alarm-monitoring company, our current Alarm Monitoring Centre is built to the highest security specifications and NSI requirements, and we provide full monitoring services for intruder alarms, fire alarms and CCTV. Based in Central London, our alarm monitoring operates 24 hours a day, 365 days a year throughout the South East. In order to ensure our service is of the highest possible quality, our monitoring services are kept in-house and are focused purely on Banham customers. We never use automated services, so our alarm controllers will respond with a personal phone call and alert you, keyholders and/or the Police and emergency services (depending on the level of response you have chosen) upon receipt of an alarm/fault signal. Crucially, all of our controllers are specially trained to deal with your emergencies and follow strict security practices and procedures. In order to ensure swift response times, our Alarm Monitoring Centre works closely with our own keyholding and alarm response services: if you’re not able to be there and want Banham to be, we will despatch a Key Guard to your property without delay. Full reporting means you can be confident your business or home alarm monitoring system is always working correctly, and we manage false alarms for you to ensure your alarm stays connected. We offer a variety of levels of alarm monitoring and response, depending on your security and insurance requirements.